On 24 May the National Library of Medicine announced its release of “’Medicine in the Americas,’ Featuring Digitized Versions of American Medical Books Dating Back to 1610“. The announcement notes that material dating up to 1920 will be continually added to the digital collection, and points out that the collection will be of use to researchers “who wish to use primary materials”. On 26 May, I did a quick search of the material. Those of us interested in the history of naval medicine will be disappointed just now: only four listings under “naval medicine”, none under “maritime medicine”, and just one under “scurvy”, a beautiful digital copy of 1798 treatise by “John Claiborne of Virginia”, written for his MD candidacy at the University of Pennsylvania. Digital copies of historical materials and digital records are a researcher’s dream because they offer convenient access, often searchable, from the comfort of one’s laptop. Archivists may love them, too, because they permit access to rare historical documents without the risk of physical damage, or worse, their disappearance. For documents of legal or evidential value, digital archiving is almost ideal because it permits archivists to get rid of the reams of paper that bear these documents. And, as governmental and other entities work toward the paperless office, “born digital” records will multiply in number and volume. But digital copies are also an archivist’s nightmare. Here’s why: have you tried looking up some document you saved on a 5.25″ floppy? Created on your Apple IIe? What about that PhD thesis you wrote using WordPerfect? The march of technical progress has made older storage media and older software almost completely useless. And there’s no reason to assume that almost annual upgrades and changes will not continue in the future. So the real issue is technological “forward migration”. Archivists know that unless some consensus on an “archival” format for saving electronic files emerges, they face the prospect of perpetually updating ever larger numbers of electronic files. At least one format is gaining broad support as an “archival” one: PDF/A. It’s a format that carries all necessary information–about font style, color–and file-related metadata in the file. This means that the file should be easy to read for a very long time. A PDF/A file cannot be altered by third parties, so it remains a “permanent” record. It’s pretty easy for you to make as sure–as is currently possible–that your work will be electronically accessible in the indefinite future. When you go to save the final version of whatever document you are working on, in Word® or Excel®, do “Save As” -> “PDF”. In the window that opens, click “Options…”, then under “PDF options”, tick the box “ISO 19005-1 (PDF/A)”. I searched the internet to find out how to do this on the Mac, but had no luck. Apple users, please “comment” the steps required to save in PDF/A format on your machines. This week and next, I’m taking basic CERT training here in a local school. I first learned about the CERT program in a disaster planning training I took on behalf of our local County Archives. CERT trained people were identified as resources for assistance to the Collection in the event of a natural or man-made disaster. CERT programs were initially developed to assist communities to take care of themselves immediately after a major disaster, when governmental first responders and the military are overwhelmed or simply unable to get to the scene because roads and bridges are disrupted. The CERT concept originated in Los Angeles in 1985. Experience with the 1987 Whittier Narrows earthquake confirmed the need for trained civilians who can meet the immediate needs of themselves, their families and their communities. My trainers here told me that the program received a huge impetus–and federal funding–as a result of 9/11. Taught by experienced first responders–in our local case by “Neil”, who was the director of Emergency Operations for nearby Napa County for more than 20 years–the training consists of 7 Sessions: Disaster Preparedness, Disaster Fire Suppression, Disaster Medical Operations parts 1 & 2, Light Search and Rescue Operations, Disaster Psychology and Team Organization, and a Course Review and Disaster Simulation. The trainers also provided the students in my class with an emergency bag “primed” with a nifty green safety helmet, bright yellow vest with large reflective “CERT” markings, and other items; we are trained on what other items we should add to this kit on our own. The emphasis here is on rescuer safety (“Who’s the most important person in a disaster?” “ME!”) and of teaching non-professionals the basic skills that will help them take care of themselves, their families and neighbors during the 3 to 7 post-disaster days that professional emergency response may be absent. I never received training like this in my medical education or during my Navy career. Once training is completed, the new CERTs are encouraged to become involved in community / neighborhood CERT organizations where they can meet from time to time to plan for disaster, maintain their training and develop a sense of team membership. What’s the situation in your community? I encourage you to look into CERT training for you and your loved ones. Ordered to join the Pacific Squadron in 1854, the U.S. Navy warship Decatur sailed from Norfolk, Virginia, through the Strait of Magellan to Valparaiso, Honolulu, and Puget Sound, then on to San Francisco, Panama, Nicaragua, and Costa Rica, while serving in the Pacific until 1859, the eve of the Civil War. Historian Lorraine McConaghy presents the ship, its officers, and its crew in a vigorous, keenly rendered case study that illuminates the forces that shaped the antebellum navy and American foreign policy at sea. One of only five ships in the squadron, the Decatur participated in numerous imperial adventures in the Far West, enforcing treaties, fighting Indians, suppressing vigilantes, and protecting commerce. With its graceful contours and towering white canvas sails, the ship patrolled the sandy border between ocean and land. Warship under Sail focuses on four episodes in the Decatur’s maneuvers: the harrowing journey from the Atlantic to the Pacific Ocean through the Strait of Magellan; a Seattle war story that contested American treaties and settlements; participation with other squadron ships on a U.S. State Department mission to Nicaragua; and more than a year spent anchored off Panama as a hospital ship. In a period of five years, more than 300 men lived aboard ship, leaving a rich record of logbooks, medical and punishment records, correspondence, personal journals, and drawings. Lorraine McConaghy has mined these records to offer a compelling social history of a warship. 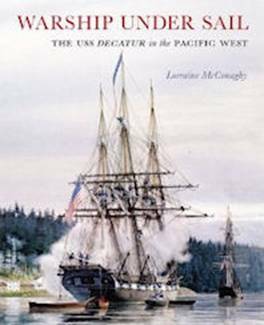 Her research adds immeasurably to the history of the Pacific West and America’s expansionist momentum in the second half of the nineteenth century. In Part 1 of this series, I discussed the Navy’s four “temporary” new constructions in northern California, which were part of Navy Surgeon General Ross McIntire’s program to provide hospital care for the casualties of war. But even these new beds were not enough to supply the needs for an expected million casualties if the expected invasion of the Japanese home islands took place. 12th Naval District medical authorities sought facilities that were “especially desirable … for convalescents and … also well suited for recreational purposes”. The Santa Cruz resort hotel Casa Del Rey fit the ticket, and could be made ready to receive 500 patients within 2 weeks of lease signing. Retired Medical Corps Captain Frederick E Porter was detailed to command the hospital, which he commissioned on 9 March 1943. The hospital experienced its busiest year in 1944, when 8099 patients were received. In all, more than 18,000 men received convalescent services before the hospital was decommissioned 1 April 1946. (3) The old hotel then went on to serve as senior citizen housing in its later years. It sustained serious damage in the 1989 Loma Prieta earthquake. It has since been demolished. beautiful outdoor swimming pool, a built-in little theater seating 130 persons and other recreational facilities on…1700 acres of mountainous terrain”, if offered excellent convalescent facilities. Up to the end of November 1945, the hospital had cared for nearly 5800 service personnel. (5) Today the facility and its grounds are owned by the Campus Crusade for Christ. with a bed capacity of 1,000, the facility cared for nearly 3,000 service members during its career. All variety of patients, including those with combat fatigue and combat psychosis were admitted. (6) Decommissioned 31 December 1945, the hospital was completely dismantled by the end of January 1946. Some of its buildings still exist as local homes. remainder administrative and support spaces and quarters. The official hospital report noted that “they were “Army huttments”, wooden frame buildings with single faced bulkheads, wooden floors without covering, and unsealed. 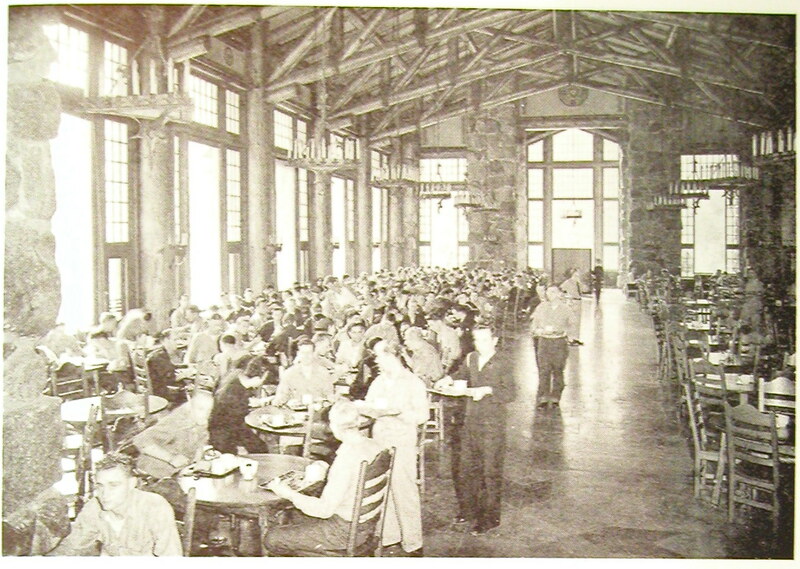 The roofs leaked occasionally, and patients had to walk a long way to mess.” The hospital cared only for “enlisted men who were general medical and surgical convalescents, and neuropsychiatric patients who were awaiting discharge.” (7) Decommissioned 31 December 1945, the hospital was completely dismantled by July 1946. One of its buildings now serves as a local hardware store. (1) United States Government Manual, 1945, First Edition, “Federal Board of Hospitalization”, found at http://www.ibiblio.org/hyperwar/ATO/USGM/FBH.html, accessed 23 April 2011. This appears to be a direct transcription of the titled government document, transcribed and formatted for HTML by Patrick Clancy of the Hyperwar Foundation. (2) National Archives and Records Administration, College Park, MD (“Archives II”), Record Group 52, Records of the Bureau of Medicine and Surgery, Headquarters Records, Correspondence 1842-1945, Entry 15B, File NH70-7 – 7/A1-1, letter Inspector of Medical Activities, Pacific Coast, to assistant chief, Bureau of Medicine and Surgery, RADM Luther Sheldon at the Bureau of Medicine and Surgery, 29 January 1943. (3) Administrative History of U. S. Naval Special Hospital, Santa Cruz, California, 30 June 1946. This file is in the “Santa Cruz” folder in the History Library at the U S Navy Bureau of Medicine and Surgery (“BuMrd”), 2300 E Street, NW, Washington, DC. (4) “Supplement to Fourth Quarter Sanitary Report [undated: 1945? ], Historical Data,” U. S. Navy Bureau of Medicine and Surgery History Library. (5) “Historical Supplement to the Fourth Quarterly Sanitary Report, Cumulative Report for Period of World War II, 28 November 1945”, U. S. Navy Bureau of Medicine and Surgery History Library. (6) Typewritten history of U. S. Naval Convalescent Hospital, Banning, CA, undated, no designated author, but presumed to be written by hospital Commanding Officer William H Short, Captain, Medical Corps, Retired, U. S. Navy Bureau of Medicine and Surgery History Library. (7) from “The United States Navy Medical Department at War, 1941 – 1945, Volume II Organization and Administration”, prepared by Administrative History Section, Administrative Division, Bureau of Medicine and Surgery, Navy Department, 1946,U. S. Navy Bureau of Medicine and Surgery History Library. I’ve been away from my desk for a couple of weeks, visiting family in Brussels. Now back to a spectacular late spring here in northern California. Later this afternoon, I’ll be giving a walking tour of the grounds of the Naval Hospital on the island, the Navy’s first on the west coast, as part of an annual May Day celebration of spring and the rich historical heritage represented by the Navy Yard on Mare Island–also the first on the west coast. Mare Island Navy Yard was established in September 1854 by Commander David G Farragut. Two days after his arrival on the 14th of that month, he called the sloop of war Warren over from her mooring in Sausalito. Aboard her was Assistant Surgeon John Mills Browne, a recent graduate of the Medical Department of Harvard University. Assistant Surgeon Brown was the first Navy Medical Officer in Mare Island. He served in Warren and then the razee frigate USS Independence, which served as the first medical facilities at the Navy Base. Browne later returned to Mare Island to supervise construction of the Yard’s first purpose-built hospital, and then served as its inaugural Commanding Officer after it opened on 1 Feb 1871. He went on to become Surgeon General of the Navy in 1888. The first land structure to serve as a hospital on Mare Island was an unused granary converted to hospital use. It opened in January 1864 and was replaced 7 years later by a majestic edifice designed by Philadelphia architect John McArthur. This structure was severely damaged in the 1898 Mare Island Earthquake, and was abandoned as unsafe. Congress immediately appropriated money for a replacement hospital, the current “H-1” on Mare Island. Until this new hospital opened in 1901, patients were hospitalized in the nearby Marine Corps barracks.The new hospitals was of wood frame construction, and while more resistant to earthquake that the earlier brick structure, the doctors commanding her fretted continually about the danger of fire. Finally, in 1928, the first of several fireproof hospital buildings were built, and H-1 spent the last 30 years of her medical career as an administration building, with a family practice clinic on her third floor. When the Mare Island Hospital was closed in 1957, the structure became headquarters for the Schools Command on Mare Island, a role she filled until the Mare Island base was closed in 1997 in BRAC I. Since then the hospital and its attendant structures have been purchased by Touro University-California. The University uses several of the hospital outbuildings for instructional and administrative spaces, but the main hospital structures, including H-1, lie fallow.